Flying Caravans in Papua.... no room for error! This aircraft landed 3 minutes after me and as you can see, it wasn't able to stop in time, so it went off the end of the runway. The engine in the aircraft is brand new, it was literally on a couple of hours old, as this was it's first day. The approach looked all good and the landing was fine too, but we were told by the captain that the reverse didn't work as they tried to slow down on the runway. We had figured, as we had heard no reverse as they came up the slightly sloped runway. At the end of the day, both crew members walked away from it unharmed, which is the most important thing. It is certainly a reminder and a wake-up call to us pilots here. Flying in Papua can be dangerous, so caution and care must be taken at all times. This could happen to anyone of us if we're not careful. Out of interest, this is the 5th airframe that has run off the runway in Ilaga Papua in the past 5 months! Certain Regional Airlines provide Essential Air Service (EAS) to various communities so that they can be connected to larger hub airports. The airlines that provide that service are then subsidized by the Department of Transportation (DOT). According to the DOT, "The Essential Air Service program was put into place to guarantee that small communities that were serviced by certificated air carriers before airline deregulation maintain a minimal level of scheduled air service." There are currently 175 such communities in the country. One of those many communities is Harrison AR. On September 20th 2016 Seaport Airlines, after almost a year of financial problems, filed for Chapter 7 and ceased operations on that day. 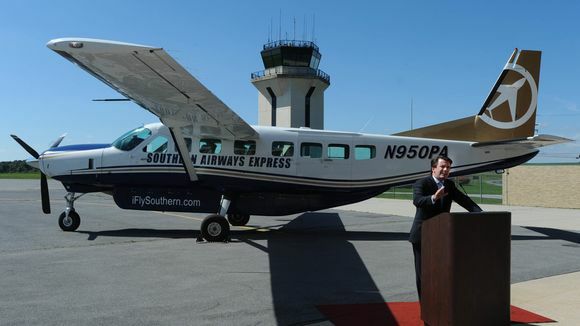 Caravan operator Southern Airways Express, a regional airline based in Southaven MS, has since taken over the Memphis TN to Harrison AR route that was previously serviced by Seaport Airlines. The Harrison airport Board of Directors requested that the DOT grant the EAS contract to Contour Airlines, but it was instead given to Southern Airways. Flights between the two cities will begin on Tuesday January 31st, with one-way fares starting at $39.